Formed in 1959 as The Del-Rios as backing vocal group for Linda Steele (2). After disbanding they renamed Chubby And The Turnpikes - four Cape Verdean - American brothers, born and raised in Providence, Rhode Island, they would later move to New Bedford, Massachusetts. They were signed at Capitol Records in 1967 and released three singles. They were renamed Tavares in the 70's. 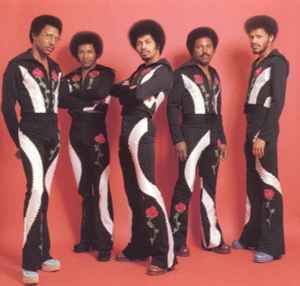 They had a No.1 R'n'B hit with their cover of Daryl Hall & John Oates' "She's Gone" in 1974. Their biggest hit is 1975's "It Only Takes A Minute" , covered in 1992 by Take That and "Heaven Must Be Missing An Angel". They have duetted with Freda Payne for "I Wanna See You Soon" in 1977. They appeared in the soundtrack of "Saturday Night Fever" and gained a Grammy award with their rendition of Bee Gees' "More Than A Woman" in 1978. After ten albums recorded for Capitol Records (produced by Johnny Bristol, the duo Brian Potter and Dennis Lambert, Freddie Perren, Bobby Martin, Benjamin Wright and Bobby Colomby, Alan Abrahams (2)) in 1980 they were signed to RCA Victor for two albums (produced by Jay Senter, Kenny Nolan, Richard Wyatt Jr., Leon Sylvers, Wardell Potts and Dana Meyers). Ralph Tavares left the group in 1984 and Tiny Tavares left in the mid 90's to join them again in 2009 for live concerts.